Red admiral in the garden this afternoon; also male brimstone and several orange tips. 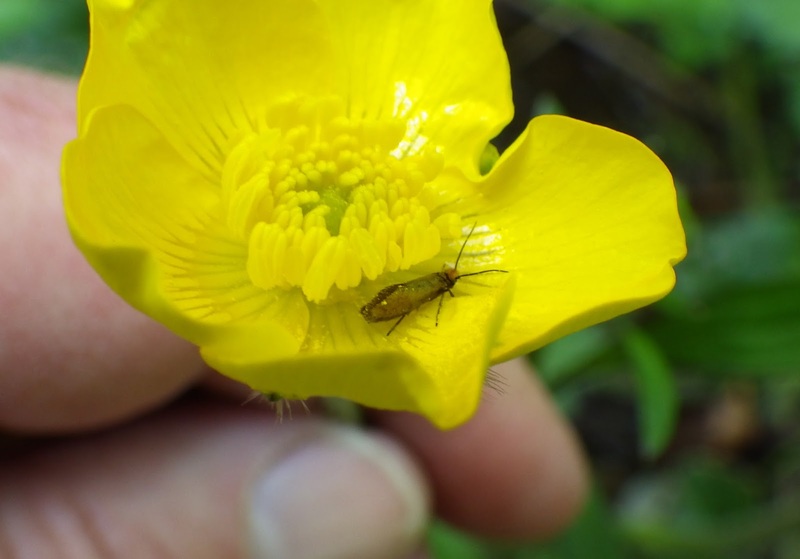 Went very briefly to nearby Stradey Woods, but little to be seen moth-wise though Micropterix calthella is now out en masse on marsh marigolds and creeping buttercups (photo below). Be aware of other species of Micropterix - indeed May is a good time to look out for these small moths in woodland or flower-rich pastures. See the good photos on Chris Manley`s British Moths (2nd Ed) pp 18-19 for identification. The small Cydia ulicetana was frequently flushed from gorse on a nearby rank pasture. Well spotted! I shall take a look around the garden as I have both Marsh Marigold and Buttercups in the garden. Where can Chris Manley's book be purchased? Thanks.